HOT! 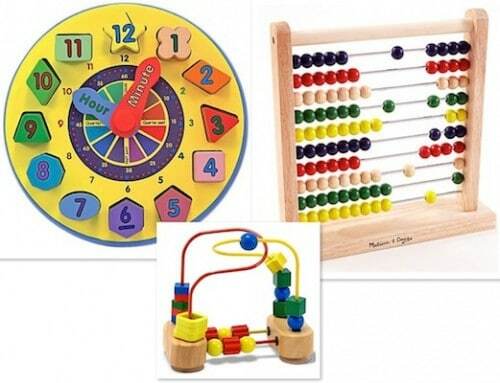 Melissa & Doug Wooden Abacus, Shape-Sorting Clock & Bead Maze for $7.32 Each, Shipped! Here's your chance to get three highly-rated and wildly popular wooden Melissa & Doug toys for way cheaper than even Amazon is selling them for right now! One Kings Lane is giving new customers who sign up through this link a FREE $15 credit that can be used on purchases of $30 or more! Plus, there are currently a lot of Melissa and Doug toy deals in the Fun for All : Toy Box Shop, including three of their most popular toys. Right now, new One Kings Lane customers can get all three of the toys pictured above for just $21.95, and that includes the cost of shipping! Final price: just $21.95, or $7.32 each! Your total price for all three would be $39.75 if you bought them from Amazon. The above One Kings Lane deal saves you 45% off of Amazon's prices!